How would I explain my lack of faith to a friend who does believe in God? How would I do so in a way that explains my worldview, and the nil chance of me changing my mind? Those were the questions that I asked myself when I wrote my comic Deprived of Religion, in a 30 minute burst in February 2018. Two months after the conversation, I revisited this idea in my mind. I decided to plainly list the ideas and thought patterns that I was taught by secular society, that are at odds with religious thinking. I wrote the first draft in a passionate 30 minute burst. My working title was Inconceivable Religion, and the initial tone of the comic was defiant. In short, stark sentences, I proudly stated the virtues of investigative journalism, the scientific method, and similar ways of evaluating evidence. I advocated secular thinking, free enquiry, and empiricism. Put simply: the reason I am not religious is because other ideas entered my mind before religion. And those other ideas are what prevents religion, or similar superstitions, from ever entering. 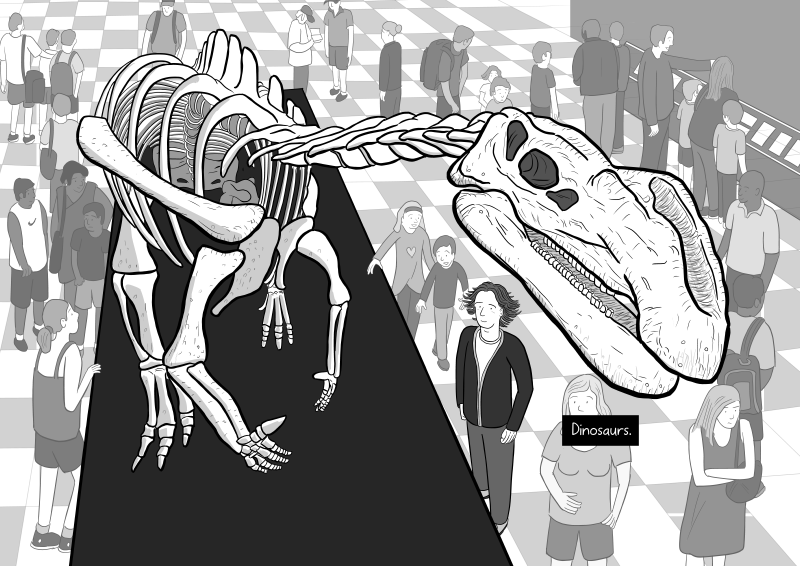 The snarkiest part of my first draft was the double-page scene of me standing beneath the Muttaburrasaurus skeleton. 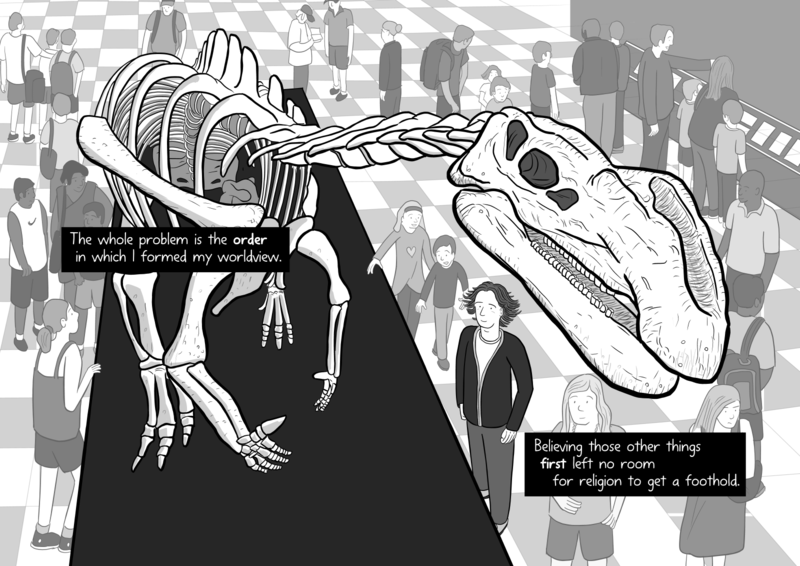 In contrast to the articulated reasons that came before, this page was supplemented with a stark one-word sentence: “Dinosaurs.” In other words, dinosaurs—and evolution—as a rebuke to religiosity. Above: how the dinosaur skeleton page would have looked, as per my original draft. Below: the revised version. I revisited the draft comic a month after my original writing burst. Although the original comic was a love letter to secularism, it veered too far towards a de-facto attack on religious people. I deliberately write comics in a way that avoids “us versus them” arguments. I see little point in publishing comics that will simply encourage people to dig into their pre-existing opinions. So I decided to make some edits. Accordingly, I decided it would be more interesting to explore the idea in a way that put myself under the microscope. It was interesting to consider that the “Christians only believe in God because they were raised that way” argument also applies to me. After all, my worldview was influenced by the culture that I was predominantly exposed to. Is it possible that I am missing something, in my inability to experience faith? In my rewrite, I decided to reframe the comic with a more ambiguous tone. After brainstorming a replacement for Inconceivable Religion, the title Deprived of Religion stood out as a ponderous option. I liked that the title painted me as the one who was missing out on something. Let’s not kid anyone. This comic is unlikely to sway anyone’s mind on the topic of faith and religion. Yet, hopefully my comic can be useful for religious people who are struggling to understand why non-religious people don’t share their belief in an afterlife. We simply have different worldviews. Though religion is a topic that ignites passions, I tried to write the comic in a neutral way. It is a simply a dispassionate list of reasons why blind faith doesn’t appeal to me. The final line of the comic—”I missed my only chance”—remains the same between the first and second drafts of the comics. But it becomes more of a Rorschach Test in the published comic, without the “dinosaurs” bite that the first draft carried. Introducing the Flying Spaghetti Monster! Readers will note the parody of Michelangelo’s The Creation of Adam that I slipped into the artwork for Deprived of Religion. For those unfamiliar with the creature that I have depicted, it is the Flying Spaghetti Monster, the deity of the Church of the Flying Spaghetti Monster. 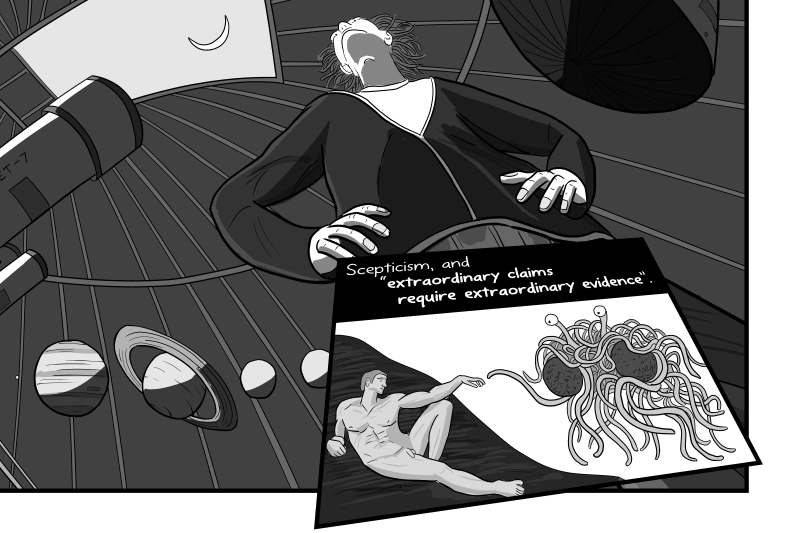 I have drawn a take on Arne Niklas Jansson’s artwork Touched by His Noodly Appendage. The Flying Spaghetti Monster (FSM) is a supposed deity who is mock-worshipped by followers of the Church of the Flying Spaghetti Monster, a religion that is also nicknamed “Pastafarianism” (a combination of the words ‘pasta’ and ‘Rastafarianism’). Followers of Pastafarianism assert that their claims about the FSM are as equally as valid as claims made by religious people about their invisible and undetectable gods. By using a colourful—reductio ad absurdum—example, It helps us to see that the burden of proof lies upon those who make unfalsifiable claims. Read the Wikipedia article for Flying Spaghetti Monster for more fun. 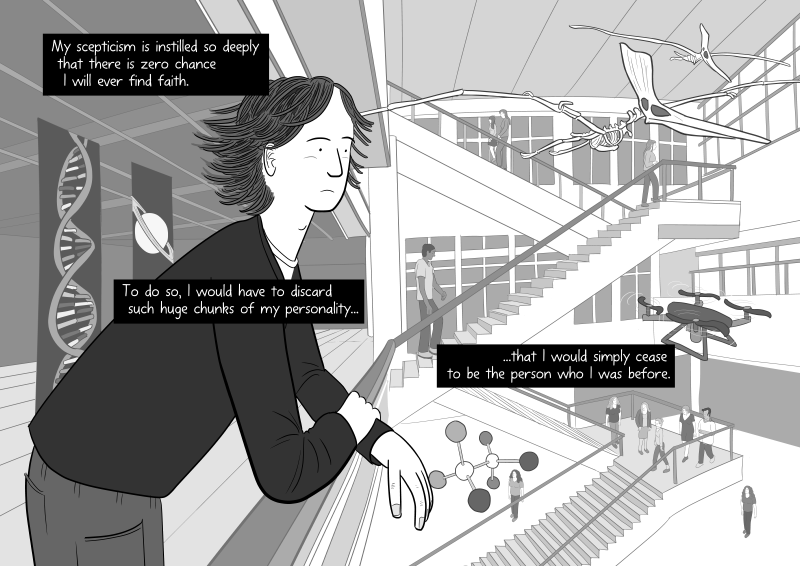 Deprived of Religion is my first ever comic touching upon faith and religion. It is an opportunity to nail my colours to the mast. It is also a test for whether I can navigate the topic in a thoughtful way. I remain a militant agnostic. I am simply unable to comprehend the certainty that religious people have for their beliefs. Talking with certainty about things that, by definition, are unknowable. It’s the supernatural claims that I baulk at. The invisible, undetectable supreme being, who we are told to accept without evidence. It would simply take an inconceivable personality shift for me to believe any of that stuff. I simply missed my chance to ever believe. Yet, I’m not relishing my inability to find faith. Religious people often seem to have a personal motivation that drives and comforts them. The big question is whether people without faith can lead lives with similar purpose. That is the spirit of Alain de Botton’s thoughtful book Religion for Atheists (2012), which advocates cherry-picking the best parts of religion (community, philosophical life guidance), and discarding the supernatural bits. That was the sort of spirit I tried to emulate when I co-organised the secular community gathering Sunday Assembly Canberra in 2016 and 2017. And now, I’ll probably get back to drawing comics about my usual stable of topics. Y’know: environmentalism, society, psychology, et cetera. I am a crowdfunded cartoonist. If you like my worldview, or my comics, please support me by joining my Patreon crowdfunding campaign via crowdfundstu.com. Yeah, 'militant agnostic' is an example of my dry humour, as I see it as being close to a contradiction in terms. My humour is often lost on people. (I'm friends with a peace activist, and I jokingly refer to him as a 'militant pacifist'!) 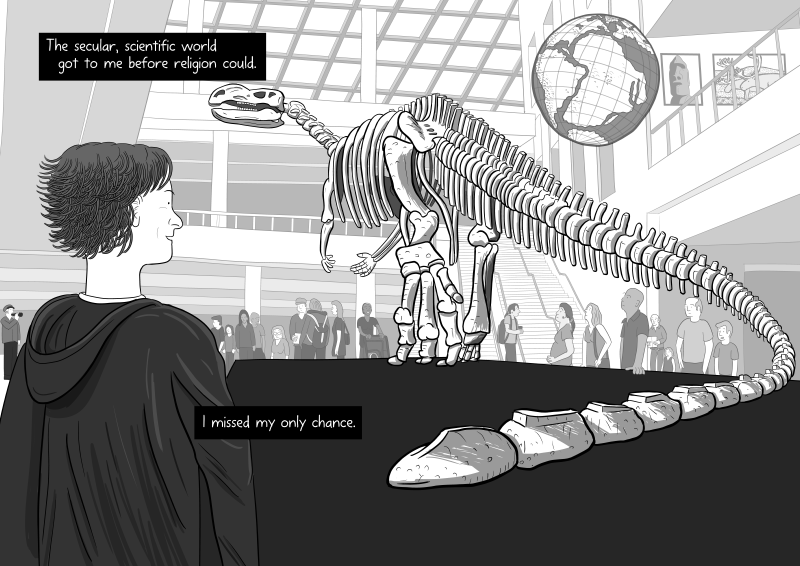 No, the museum in question with the Muttaburrasaurus isn't based on any particular museum. I borrowed from a lot of different location photos. Thanks for taking the time to comment - I appreciate your comments about how your past compares and contrasts to mine.